Rowan Liburd shoots for Guiseley. 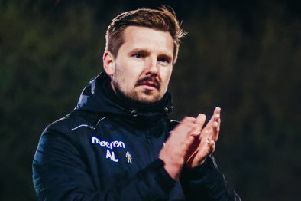 An action-packed game saw Guiseley and Spennymoor Town share the points after a 1-1 draw in their National North encounter at Nethermoor on Saturday. Both sides created plenty of chances and on another day there would have been more goals. Guiseley joint manager Marcus Bignot. The hosts started well and had the ball in the net after good work by Alex Purver found Rowan Liburd who flicked his shot past Matthew Gould but the striker was adjudged to have been offside. Spennymoor took the lead just before half-time, when a cross into the area looked to have been handled by Cliff Moyo before striker Glen Taylor stepped up and confidently placed his effort into the bottom right-hand corner. The visitors should have doubled their advantage after the break, when a corner was swung in and found James Curtis – his powerful header was tipped onto the woodwork by Guiseley keeper Jon Worsnop. The scores would soon be level. After a ball over the top found Liburd, he beat his man for pace and fired an effort into the back of the net, to the joy of the home fans. Spennymoor went down to 10 men when Stephen Brogan was sent off after he picked up a second yellow card. This gave Guiseley a boost, they pushed players forward looking to get the advantage. The hosts nearly grabbed a dramatic winner when a long throw into the area found Will Hatfield whose over-head kick needed to be tipped over the crossbar. After the game Guiseley joint-manager Marcus Bignot said: “We didn’t lose and that is important against a good side. There are plenty of positives, we are in a good position and you look at Spennymoor who are up there and we did well. Elsewhere, Bradford Park Avenue stayed top of the table after Shane Killock’s second goal of the game in stoppage time completed a fightback from 2-0 down at home to Ashton United. The visitors were in the ascendancy at half-time thanks to Bradley Jackson and Liam Martin goals. A long-range Lewis Knight effort reduced the deficit before Killock steered home after the ball fell to him in the away box. The home captain went on to add his second of the afternoon after the Ashton defence were carved open again at the death. York City dropped into National League North’s bottom six with a 3-0 defeat at Altrincham meaning they have taken just one point from a possible 15.